Follow the money, all roads lead to the Penokees. On February 17, 2011, 14 Wisconsin Senate Democrats fled to Illinois after seeing Scott Walker’s ALEC-driven budget repair bill. Insider sources tell us it was more than likely Mike Ellis who tipped off Jon Erpenbach that they were going to lock them into the Senate chambers and force them to vote on the bill. Oh what a difference a year makes. On February 15, 2012 Scott Fitzgerald (R-ALEC) used his power of majority to dismantle the Senate Mining Committee, cancel a public hearing in Platteville and send the horrific AB426 Mining bill (that was illegally passed in a locked Assembly chambers on January 26 by his fascist brother Jeff) straight into the Joint Finance Committee. Clearly, history proves the Democrats did the right thing. An anonymous insider told me yesterday, Fitzgerald is working as fast as he can before he gets indicted for collusion, among other things, for leading the treasonous movement to illegally redistrict the state with the intention to disenfranchise voters of color. By coercing the rest of the Republican Party to sign secrecy agreements about the maps, he may very well have committed a felony. The court released 84 emails yesterday revealing the disgusting and mind-boggling lies and collusion that he and state Republicans have been foisting upon us. Today in Room 412E of the State Capitol, We the People will be able to testify against this outrageous usurping of our democracy, as well as symbolically lay down our bodies in front of the Caterpiller-made equipment that will be headed north to blow the tops off the Penokee Mountains and destroy northern Wisconsin, all in the name of profits for Cline Mines and many other corporations in the WMC. If this mining bill passes, a full investigation will be called for into violation of Federal Treaty rights as well as collusion and perjury on the parts of the Republican legislators. Already, public records requests have begun. It is not coincidence that Reince Priebus, chairman of the Republican National Committee, is a partner of the law firm that drafted the redistricting secrecy agreements. The good news is this will lead the trail right back to Karl Rove. For those of us working to get Rove, Bush and Cheney to the Hague, if Wisconsin Fascists rush this bill through and begin the genocide of the Bad River people, we would hope to see them there as well for their crimes against humanity. Also remember, Cline Mines, via GTAC, have direct connections to the Carlyle Group, the biggest war profiteering conglomerate on the planet. Bill Williams, president of GTAC, will be liable for crimes against humanity as well. and demand that they register your vote against the mine and that it be entered into the public testimony. Never before have so many been ignored by so few. No more. 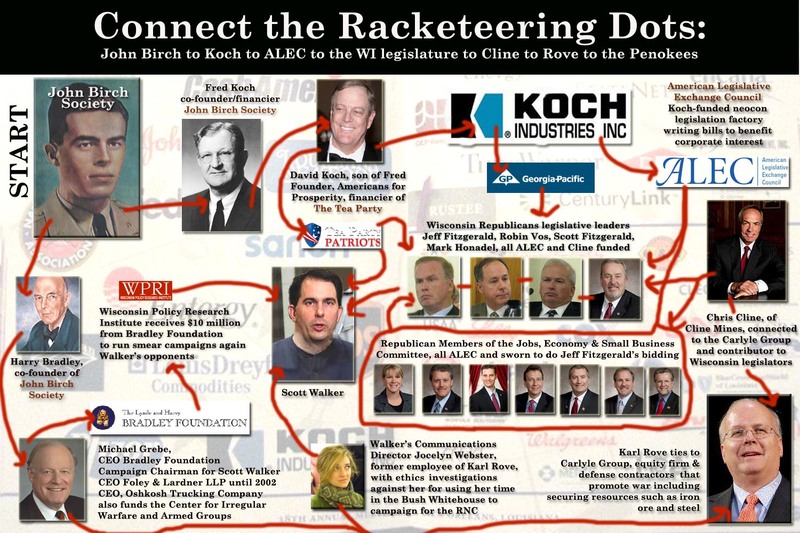 The reign of terror Wisconsin Republicans started when Walker “dropped the bomb” is about to come to a close. But hold on, it’s going to be a wild ride.